The exterior paint on your home increases the resale value if you are looking to sell. Fresh paint increases curb appeal and extends the longevity of the exterior. A good paint company takes several things into consideration when painting an exterior. Save time and money over the long-term by investing in high-quality paint. Not only does better paint mean less coats to get the needed coverage but it also lasts longer. While cheaper paint may seem a better option in the short-term, it often costs more over the years. 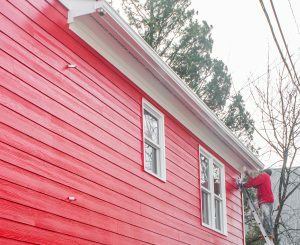 When a primer is applied first, it can cover up any old colors or discolorations in the wood or siding. In addition, primer can save you money on the amount of colored paint needed to fully cover the surface. For an even coverage, consider combining multiple gallon cans into a larger five-gallon bucket and mixing. The variations in color blend together for a more uniform color. Exterior painting should be done top to bottom. This allows the painter to work with gravity, control streaks and easily deal with mishaps along the way. Exterior painting done by a professional company ensures the best results. In addition, they can add grit to your porches and steps for added traction. Plus, they handle the clean-up saving you time.